... in front of you the Duomo. A few metres aside the Opera Museum, Piazza della Signoria, the etnology and anthropology Museum, the Uffizi, Ponte Vecchio, shopping in Via de' Tornabuoni. And if you really want to go far ... in five minutes walk... Palazzo Pitti. 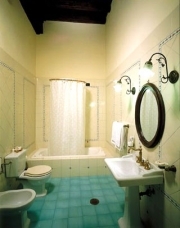 Very few rooms, meant to those worship Italian Renaissance and to those who love its culture, where privacy and freedom of B&B are combined with a high standard treatment, with the personalized service after the well known hospitality of the Italian tradition, under the direct care of the owners. A home you feel yours, with independent telephone, heating, conditioned air, satellite tv, private bar, infusions percolator, little safe deposit bos, soundproof windows, hydro-massage and…..breakfast in your room. From the airport: the easiest way to reach the estate is by taxi. You can also take the public bus to the railway station. From the railway station: the residence is at a few minutes walking distance. Railway Station S. M. Novella: 500 mt. Motorway exits A1: "Firenze Sud" 6 km, "Firenze Certosa" 9 km. Motorway exit A11: "Firenze Peretola" 6 km.